Unless otherwise noted, all contents of this Website, including, without limitation, all text, programs, products, processes, technology, information, content and other materials, together with all copyrights, trademarks, trade dress and/or other intellectual property therein (collectively, “Contents”), and the compilation (meaning the collection, arrangement, and assembly) are owned by us, or by third parties who have licensed such Contents to us. Such Contents are protected by U.S. and international copyright laws. We, on behalf of ourselves and our licensors, expressly reserve all rights, including, without limitation, intellectual property rights, in this Website and all Contents and compilation of Contents from time to time available on this Website. Access to this Website does not confer, and shall not be considered as conferring, upon you or any other user of the Website any license or other rights to the Website, the Contents or the compilation of Contents. We have not reviewed all the third party sites linked to or framing this Website and are not responsible for the contents of any pages contained on such third party sites. By entering this Website you acknowledge and agree that the Department of Parks and Recreation (Department) has not reviewed all the third party sites linked to or framing this Website and is not responsible for the content of any pages of such third party sites. We do not make any representations or warranties as to the security of any information (including, without limitation, credit card and other personal information) you may have or might be requested to give to any third party, and you hereby irrevocably waive any claim against us with respect to such third party sites and their content. Your linking to any sites or to any other pages connected to such sites is at your own risk. The County has adopted the following guidelines and policies around Social Media. 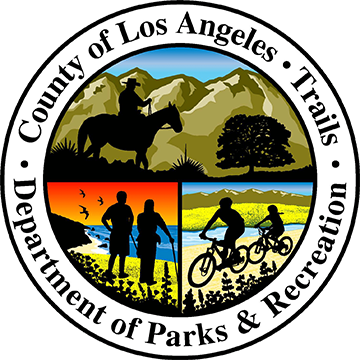 General Policy: The County of Los Angeles Department of Parks and Recreation (Department) manages the Los Angeles County Trails Website (Website) to provide a forum for improving communications with our employees, government customers, and the general public. This Website will include comments, activities, and other information deemed to be relevant and of interest regarding trails. The policies for use of this site are subject to amendment or modification at any time to ensure the Short Messaging Service’s (SMS) continued use is consistent with its intended purpose as a limited forum. Posting Policy: You are encouraged to share your comments, ideas, and concerns. This is a moderated Website and the Department will only post comments from contributors over 13 years of age that relate to topics on trails. The Department will review all comments before posting them. The Department will not post comments that are deemed to contain offensive, abusive, obscene, threatening or harassing language, personal attacks of any kind, or offensive terms that target specific individuals or groups. The Department will not post comments that are clearly off-topic, that promote services or products, or promote or oppose any political party, person(s) campaigning for elected office, or any ballot proposition. Any comments posted do not reflect the views of the County. Inappropriate Content is Prohibited: Threats, harassment, lewdness, hate speech, and other displays of bigotry are considered inappropriate content and will be rejected. Conflicts of Interest: Users should not write reviews that make reference to their own business or seek to advertise their own business. Relevance: Website account users' public reviews shall be relevant and appropriate to the forum. Privacy: Personal and/or private information is strongly discouraged. Other Links Policy. Gratuitous links to sites are viewed as spam and may result in the comment being removed. Communications made through this Website will in no way constitute a legal or official notice or comment to the Department or any official or employee of the Department for any purpose. The content of all comments are released into the public domain unless the commenter clearly states otherwise, so do not submit comments that you do not wish to be broadcast to the general public. The Department does not discriminate against views, but reserves the right to refrain from posting comments that do not adhere to this policy. The Department will make best efforts to review comments and post them as quickly as possible. Advertising by Website host: Any references to commercial entities, products, services or other non-governmental organizations or individuals that are included in this Website are provided solely for the information using this Website. These references are not intended to reflect the sponsorship or opinion of the Department or its officers or employees concerning the significance, priority or importance to be given the referenced entity, product, service, or organization. Such references are not an official or personal endorsement of any product, person or service, and may not be quoted or reproduced for the purpose of stating or implying Department endorsement or approval of any product, person or service. Records Management: All County sites must conform and comply with applicable records maintenance and disposition policies. Posts and comments to and from this Website, in connection with the transaction of public business, are subject to the Public Records Act and e-discovery laws and may be disclosed to third parties. Linking Policy: This Website may include useful hypertext links or pointers to information created and maintained by other public and private organizations and individuals’ SMS. This Website provides these links and pointers solely for the site users’ information and convenience. Please refer to the Disclaimer on advertising and hotlinks published at this link. Copyright Information: Links to this Website are welcomed. Unless a copyright is indicated, information on this Website is public domain and may be copied and distributed without permission. Citation to the County of Los Angeles Department of Parks and Recreation as the source of information is appreciated. If a copyright is indicated on a video, photo, graphic, or other material, permission to copy the material must be obtained from the original source. Public Affairs: If you would like verification or a transcript of information released on this Website or if you have any questions or comments about the information presented, please contact the Public Information Office at (trails@parks.lacounty.gov). Rights: This Website is a portal for information from Department. However, information posted on this site is not official policy of Department and will in no way grant anyone any rights, privileges, or standing on any matter. All information should be verified through official channels at the Department. For additional information please visit http://parks.lacounty.gov/wps/portal/dpr.